You guys, I am not usually one to jump on bandwagons. I avoid MLM schemes like the plague, I roll my eyes at the new diet fads that come out and patiently wait for them to pass...that stuff is just not me. But, I recently have made the jump onto the newest bandwagon in Teacher World...teaching for VIPKID. In case you aren't familiar, VIPKID is a company that hires native English speakers to teach English to children in China. I kept getting sponsored ads for it on Facebook and ignored them. Honestly, I figured it was a scam. Then a couple of colleagues in my building started teaching for them and said how much they loved it--and they actually got paid! They said it was fun and easy and a great way to make money. I still resisted. At the time, they had a minimum requirement of 7.5 hours a week, and I didn't know if I could fit it into my schedule. After all, my husband has been working full time and also doing grad school and intern hours as a therapist full time, so he's almost never home, leaving me to tend to our two littles alone. Fitting in another whole work day didn't seem feasible. Then they removed the minimum hour requirement, the school year ended, and we had some things come up in our personal life that some extra money would really help with, so I decided to take the plunge. The interview and hiring process was a little intense. You have to teach sample lessons to adults pretending to be children, who are also grading you at the time. It was a little awkward. After getting hired, though, I've really liked it! The classes fly by, the kids are cute, and there's little planning involved. I've been fortunate in that I've had all of my time slots booked from the get-go. This doesn't happen for everyone right away. I think this is because I have a few years of teaching experience, I have a master's degree, and I am certified in ESOL, all of which I mention in my bio. I also opened slots during their peak times, which just happened to be the times that work best for me. It's actually working out perfectly; I teach from 6:00-7:30 or 8:00 am, and then I am finished about the time my kids are getting up and around. It's weird starting the day off with them knowing I've already put in an hour and a half or so of work, from my computer, without leaving my house! And I don't feel like it has taken away from any of my time with them; I'm still able to fully enjoy my summer! I am excited about how this job has the potential to seriously help with our debt snowball (Dave Ramsey, anyone?) and I don't spend any of my time or money on commuting, gas, daycare, etc. I have no intentions of turning this into a VIPKID blog; there are plenty of those out there, and that's not my niche. However, I did want to share it because I think other teachers could really benefit. I am happy to answer questions! If you would like to hear more about this opportunity, send me an email at applestoapplique@gmail.com. Click here to use my referral link, and then enter code 02YUUI in the referral box. 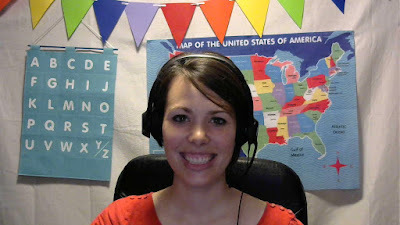 I'll update you all occasionally on my experience with VIPKID, but I will still focus primarily on early childhood ideas. I'm getting ready to roll out some new resources in my TPT store, and am working on coming up with some great differentiation ideas for the early childhood classroom, so stay tuned! It may be summer, but teaching never really stops!